MIO Mechanical offers a variety of compact, lightweight, durable Soft-Pack energy absorbers that reduce the possibility of serious injuries by limiting the arresting force to less than 900 lbs. The clear protective covering provides for fast, easy visual inspection. Locking snaphooks reduce the possibility of accidental disengagement. 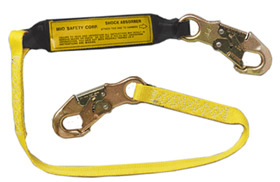 All Soft-Pack energy absorbing lanyards come standard with #3155 locking snaphooks on each end unless otherwise noted. CSA Z259.1 approved models are available upon request. 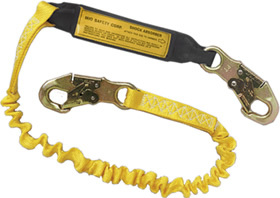 With two (2) 1" wide polyester web lanyards with a locking snaphooks on each of three ends. Elasticized 6ft. long polyester web lanyards with a locking snaphook on each end. Retracts to 4 1/2" when not under tension.